Geography of eastern Indonesia with principal tectonic features. Anyone scientifically familiar with eastern Indonesia will know of two things: that it is crossed by the Wallace Line, a famous biogeographic boundary between Asia and Australia, and secondly, that the geology is very complex. The biological diversity, including strange endemic species such as tarsiers, babirusa and marsupial bear cuscus, and unusual fossils such as pygmy elephants, has often been attributed to long isolation of the region, but recent studies suggest it is very young. The diversity is, in fact, linked to geological change, as Alfred Russel Wallace realised more than 150 years ago, although at that time continents were thought to be fixed. Plate tectonics explained change as the result of the collision of South East Asia with the Australian continent due to convergence between the Eurasian, Australian and Pacific plates, but recent work has shown that the results are different from those previously suggested. Rapid and recent tectonic processes causing emergence of land and subsidence of basins are now interpreted as a result of extension driven by subduction, rather than multiple collisions. Although there is hydrocarbon production in areas such as East Sulawesi, Seram and the Bird’s Head of New Guinea, and the region is well known for numerous active seeps and mud volcanism, exploration has been limited. On land this reflects remoteness, a relatively small population, lack of infrastructure, and challenging terrain, vegetation and climate. The majority of the islands have been geologically mapped at a reconnaissance level, but most remain under-investigated. Timor, with a long dry season and relatively limited vegetation cover, is the best studied, but the rainforest islands from Sulawesi to the Moluccas in the Banda Sea are much less well-known. Until recently, for example, the most extensive surveys of Seram, the largest island of the northern Banda Arc, were those of the Dutch in the early 20th century. Offshore, exploration was limited by similar factors, with a small number of scientific cruises, few seismic surveys and little drilling due to high costs. Larger basins were crossed by only a few regional seismic lines. So although evidence of hydrocarbons and Australian continental crust may be attractive, the geological complexity is challenging. The lack of exploration meant that major features, such as the troughs that surround the Banda Arc, were traced and interpreted in different ways, with considerable disagreement between tectonic models. Part of eastern Indonesia: SRTM topography on land and satellite gravity as background, northern part of the offshore region, with detailed multibeam bathymetry for most of southern offshore area. 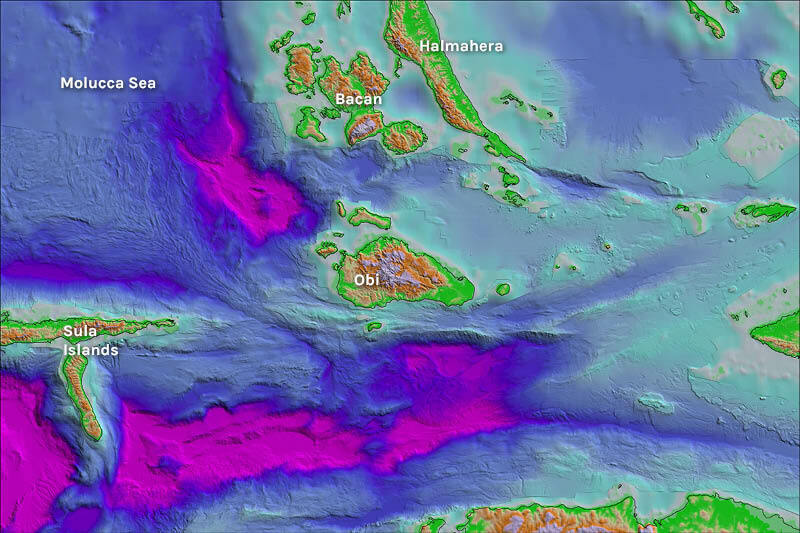 The image shows strands of the Sorong fault, the southern end of a deformed sediment wedge in the Molucca Sea, subsided carbonate reefs south of Misool and the western end of the Seram Trough north of Seram. Widely accepted models interpreted fragments of continental crust to have been sliced off the Bird’s Head of New Guinea by strike-slip faulting as Australia moved north, and carried west to collide in Sulawesi. This concept was proposed by Warren Hamilton in the 1970s and was given the name ‘bacon slicer’. The Sorong Fault crosses the northern Bird’s Head and was traced westwards, based on very limited offshore data, and interpreted to link to major faults in Sulawesi. However, the distribution of microcontinental fragments in eastern Indonesia is difficult to explain by strike-slip movements and it was observed in the 1980s that Australian continental crust in the Outer Banda Arc islands must have been within the arc before collision with the Australian margin. There were major disagreements about the ages of Geography of eastern Indonesia with principal tectonic features. the ocean basins within the Banda Arc, which some suggested to be Mesozoic while others interpreted as Cenozoic. These controversies reflected the quality of information. On land, mapping was dependent on inaccurate paper maps, limited air photo coverage and a few airborne radar surveys. There was little dating of rocks and minerals: sedimentary, igneous and metamorphic – most radiometric ages were acquired by the problematical K-Ar technique. Both on land and offshore, 2D seismic data was sparse, and traces of major structural features were often speculative. From the 1980s, satellite-derived marine gravity measurements improved mapping of offshore bathymetry. In the late 1990s, academic marine geophysical surveys and dredging showed the ages of Banda oceanic basins were Neogene, and a new phase of seismic acquisition began offshore, initially with widely spaced regional lines. On land, from the early 2000s, new public domain images from Shuttle Radar Topography Mission (SRTM) and Advanced Spaceborne Thermal Emission and Reflection Radiometer (ASTER) provided views through clouds, forest cover and mountains. They showed structural detail, and combined with GPS dramatically improved our ability to locate, sample, map and interpret the geology. Interpreted seismic line crossing north-western Gorontalo Bay beneath the lines of pinnacle reefs seen at the top of the blue unit. In the centre of the line there is about 5,000 ms TWT of sediment interpreted to be of Neogene age. The basin is undrilled. On land about 50 km to the west are exhumed granites 3 million years old. Subsidence of reefs, and uplift and exhumation of granites and metamorphic rocks, are interpreted to be approximately synchronous and driven by major north-north-west to south-south-east extension. Offshore, multi-client surveys undertaken in the last 20 years have acquired seismic data that has steadily improved in abundance and quality. Recent multibeam marine bathymetric surveys now provide better resolution than SRTM (initially 90m, now 30m pixel size). They were undertaken to aid sampling of sea floor seeps, but also revealed structural features in great detail. Thus, the interpretation of high resolution seafloor images can be linked to structures imaged on land. This has made it possible, for example, to trace the troughs around the Banda Arc to within a few tens of metres, and link onshore and offshore faults. Although there are still few wells and little sampling offshore, mapping of structures from land to offshore provides the basis for interpretation and indirect dating of features on seismic lines and multibeam maps by dating rocks on land. 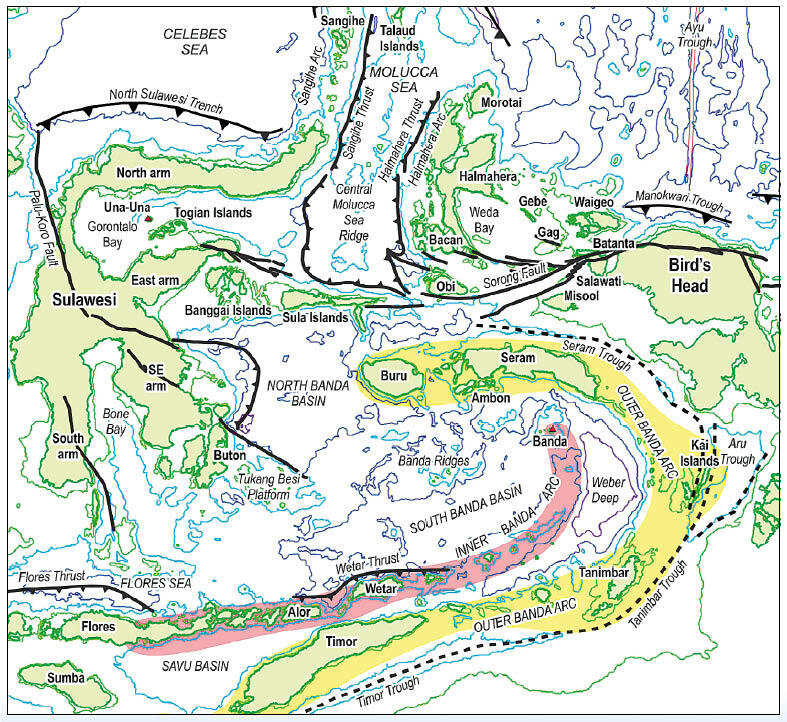 Tectonic reconstructions of the Banda Arc development at 15 Ma, 10 Ma and 3 Ma showing rollback of the Banda subduction zone into the former Banda Embayment with extension of the upper plate leading to extreme extension of the former Sula Spur and formation of North and South Banda Basins, floored by oceanic crust. Rollback of the North Sulawesi subduction zone began in the last few million years and resulted in extension, uplift of metamorphic core complexes and subsidence of reefs. In the last few years studies between Sulawesi and the Bird’s Head by the South East Asia Research Group at Royal Holloway have yielded major surprises. Radiometric dating, particularly using the Ar-Ar method and U-Pb dating of zircons, and low temperature thermochronology, have shown that previously undated metamorphic and igneous rocks considered to be Palaeozoic to Mesozoic are very much younger, commonly Miocene and Pliocene. 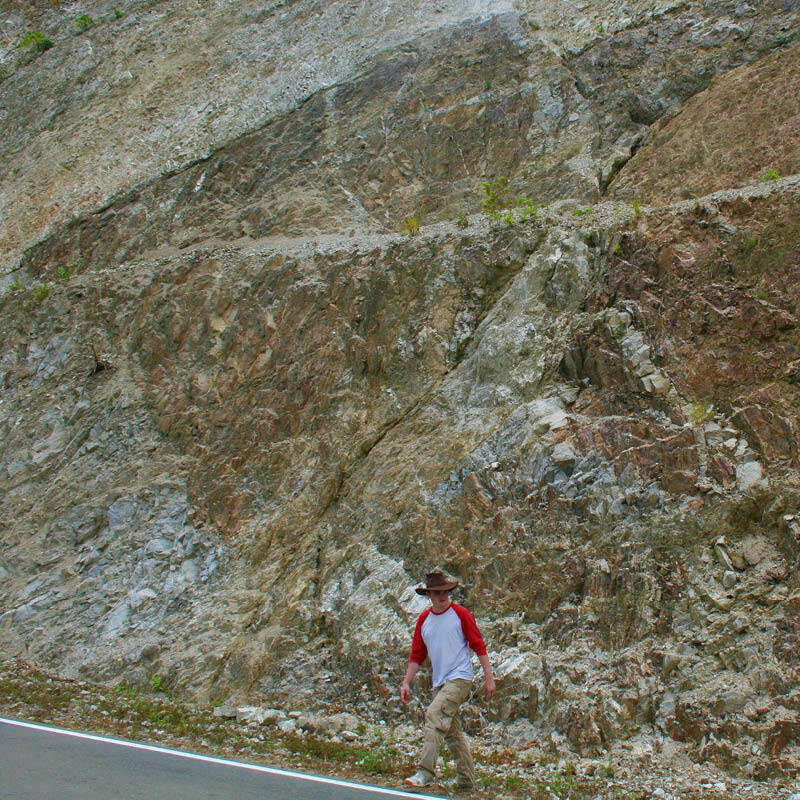 Massive granite body and granite dykes cutting metamorphic rocks in Sulawesi Neck. The granites are 3 Ma old. Image credit: Robert Hall. The youngest metamorphic rocks recently dated in the North Moluccas have ages of less than 1 Ma. Many of these rocks, visible on the high resolution imagery, are parts of metamorphic core complexes or exhumed in strike-slip fault zones, implying major extension. Offshore, common features in many areas on multibeam images are spectacular reefs, with features including rimmed platforms and pinnacles, but now at depths up to 2 km. Close to Sulawesi subsidence of reefs is clearly very young and is interpreted to be synchronous with exhumation and elevation of metamorphic core complexes and granites on land which are 3 Ma or younger. On the north side of the Seram Trough reef carbonates record multiple episodes of rapid late Pliocene and younger subsidence linked to northward thrusting of the Seram fold and thrust belt. Mapping of major fault systems shows how the Sorong Fault system breaks up after crossing the Bird’s Head into multiple splays at its western end, which are not linked to strike-slip faults on Sulawesi. It is now clear that faults shown on many older geological maps are commonly speculations or non-existent and owe their continued appearance to repetition and recycling rather than evidence. 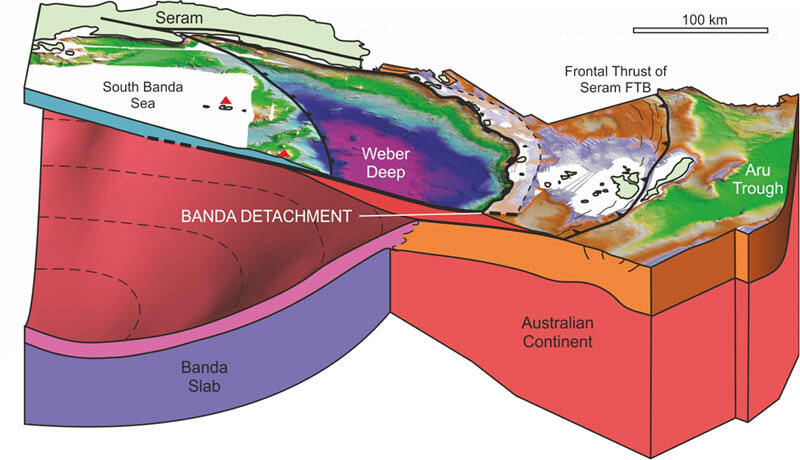 3D cartoon showing the highly extended Weber Deep above the subducted Banda slab. This marks the final stage of subduction rollback into the Banda Embayment, which is probably ongoing today. Metamorphic rocks in nearby islands around the arc have Pliocene radiometric ages. The 7 km Weber Deep in the eastern Banda Arc, south-east of Seram, is the Earth’s deepest forearc basin. The geological interpretation of the region in terms of multiple collisions of tectonic slices moving from the east has been significantly modified. There was certainly a collision in the Early Miocene of an Australian continental promontory, the Sula Spur, with the North Sulawesi volcanic arc and parts of the Eurasian margin in western Sulawesi. This was the first contact of the Australian continent with South East Asia. Subsequently, a few fragments of continental crust became mixed in the Sorong strike-slip fault zone with arc and ophiolitic fragments from the Philippine Sea plate at the northern margin of the Australian continent between the Bird’s Head and the Sula islands. However, during the Neogene most fragmentation was due to extension, related first to subduction rollback into the Banda Embayment, which continues today, and younger rollback-related extension related to subduction of the Celebes Sea at the North Sulawesi trench. Extension has been extreme: the middle and lower crust have been exhumed in core complexes, and rocks from the base of the crust and sub-continental lithospheric mantle are found in strike-slip fault zones. The very young age and high rates of Neogene extension which formed the high mountains and deep basins are becoming clearer as our work proceeds. Our tectonic model for eastern Indonesia continues to develop as, for example, new dating is carried out and interpretation of SRTM, multibeam and seismic data proceeds. Studies using seismic tomography, which images the mantle, provide an important independent way to test and evaluate different tectonic models. Thus, they can be used with greater confidence to identify areas that are more likely to be successful in exploration, potentially explaining intervals of faulting and subsidence. New sources and major inputs of sediment were mainly not related to collision, but to uplift driven by extension. Numerical modelling will provide estimates of heatflow which can be used to assess basin histories and implications for maturity. It is clear that models developed in other tectonic settings, such as older Atlantic-type passive margins, need to be used with caution since in eastern Indonesia extension-related processes have been very much faster. Geological observations from eastern Indonesia support molecular biological studies showing the speed and young age of change and the resulting spectacular consequences on palaeogeography and life. The author would like to thank all the companies who have helped SEARG with its eastern Indonesia projects, particularly those who have provided data: CGG, Fugro, GDV, Niko, PGS, Searcher and TGS. Frantz, L.A.F. et al. 2018. Synchronous diversification of Sulawesi's iconic artiodactyls driven by recent geological events. Proceedings of the Royal Society B: Biological Sciences, 285 (1876). doi:10.1098/rspb.2017.2566. Hall, R. 2002. Cenozoic geological and plate tectonic evolution of SE Asia and the SW Pacific: computer-based reconstructions, model and animations. Journal of Asian Earth Sciences, 20, 353-434. doi:10.1016/S1367-9120(01)00069-4. Hall, R. 2012. Late Jurassic–Cenozoic reconstructions of the Indonesian region and the Indian Ocean. Tectonophysics, 570-571, 1-41. doi:10.1016/j.tecto.2012.04.021. Hall, R. 2017. SE Asia: New views of the geology of the Malay Archipelago. Annual Review of Earth and Planetary Science, 45, 331-358. doi:10.1146/annurev-earth-063016-020633. Hall, R. 2018. The subduction initiation stage of the Wilson cycle. In: Wilson, R.W., Houseman, G.A., McCaffrey, K.J.W., Doré, A.G. & Buiter, S.J.H. (Eds. ), Fifty Years of the Wilson Cycle Concept in Plate Tectonics. Geological Society of London Special Publication, 470. doi:10.1144/SP470.3. Hall, R. & Spakman, W. 2015. Mantle structure and tectonic history of SE Asia. Tectonophysics, 658, 14-45. doi:10.1016/j.tecto.2015.07.003. Hamilton, W. 1979. Tectonics of the Indonesian Region. USGS Professional Paper, 1078, 345 pp. doi:10.3133/pp1078. Hennig, J., Hall, R. & Armstrong, R. 2016. U-Pb zircon geochronology of rocks from west Central Sulawesi, Indonesia: Extension-related metamorphism and magmatism during the early stages of mountain building. Gondwana Research, 32, 41-63. doi:10.1016/j.gr.2014.12.012. Hennig, J., Hall, R., Forster, M.A., Kohn, B.P. & Lister, G.S. 2017. Rapid cooling and exhumation as a consequence of extension and crustal thinning: Inferences from the late Miocene to Pliocene Palu Metamorphic Complex, Sulawesi, Indonesia. Tectonophysics, 712-713, 600-622. doi:10.1016/j.tecto.2017.06.025. Hinschberger, F., Malod, J.A., Rehault, J.P. & Burhanuddin, S. 2003. Apport de la bathymétrie et de la géomorphologie à la géodynamique des mers de l'Est-indonésian. Bulletin de la Société géologique de France, 174, 545-560. doi:10.2113/174.6.529. Klompé, T.H.F. 1954. The structural importance of the Sula Spur (Indonesia). Indonesian Journal of Natural Sciences, 110, 21-40. Lohman, D.J., de Bruyn, M., Page, T., von Rintelen, K., Hall, R., Ng, P.K.L., Shih, H.-T., Carvalho, G.R. & von Rintelen, T. 2011. Biogeography of the Indo-Australian archipelago. Annual Review of Ecology, Evolution, and Systematics, 42, 205-226. doi:10.1146/annurev-ecolsys-102710-145001. Merker, S., Driller, C., Perwitasari-Farajallah, D., Pamungkas, J. & Zischler, H. 2009. Elucidating geological and biological processes underlying the diversification of Sulawesi tarsiers. Proceedings of the National Academy of Sciences, 106, 8459-8464. doi:10.1073/pnas.0900319106. Nugraha, A.M.S. & Hall, R. 2018. Late Cenozoic palaeogeography of Sulawesi, Indonesia. Palaeogeography, Palaeoclimatology, Palaeoecology, 490, 191-209. doi:10.1016/j.palaeo.2017.10.033. Orange, D.L., Teas, P.A. & Decker, J. 2010. Multibeam backscatter - Insights into marine geological processes and hydrocarbon seepage. 2010 Offshore Technology Conference, OTC 20860 1-22. doi:10.4043/20860-MS.
Pezzati, G., Hall, R., Burgess, P. & Perez-Gussinye, M. 2014. The Poso Basin in Gorontalo Bay, Sulawesi: Extension related to core complex formation on land. Proceedings Indonesian Petroleum Association, 38th Annual Convention, IPA14-G-297 1-12. Pholbud, P., Hall, R., Advokaat, E., Burgess, P. & Rudyawan, A. 2012. A new interpretation of Gorontalo Bay, Sulawesi. Proceedings Indonesian Petroleum Association, 36th Annual Convention, IPA12-G-039 1-23. Pownall, J.M., Hall, R., Armstrong, R.A. & Forster, M.A. 2014. Earth’s youngest known ultrahigh-temperature granulites discovered on Seram, eastern Indonesia. Geology, 42, 279-282. doi:10.1130/G35230.1. Pownall, J.M., Hall, R. & Lister, G.S. 2016. Rolling open Earth's deepest forearc basin. Geology, 44, 947-950. doi:10.1130/g38051.1. Pownall, J.M., Hall, R. & Watkinson, I.M. 2013. Extreme extension across Seram and Ambon, eastern Indonesia: evidence for Banda slab rollback. Solid Earth, 4, 277-314. doi:10.5194/se-4-277-2013. Smith, W.H.F. & Sandwell, D.T. 1997. Global seafloor topography from satellite altimetry and ship depth soundings. Science, 277, 1956-1962. doi:10.1126/science.277.5334.1956. Spencer, J.E. 2010. Structural analysis of three extensional detachment faults with data from the 2000 Space-Shuttle Radar Topography Mission. GSA Today, 20, 4-10. doi:10.1130/GSATG59A. Stelbrink, B., Albrecht, C., Hall, R. & von Rintelen, T. 2012. The biogeography of Sulawesi revisited: is there evidence for a vicariant origin of taxa on Wallace’s “anomalous island”? Evolution, 2012, 1-20. doi:10.1111/j.1558-5646.2012.01588.x. Sukamto, R. & Simandjuntak, T.O. 1983. Tectonic relationship between geologic provinces of western Sulawesi, eastern Sulawesi and Banggai-Sula in the light of sedimentological aspects. Bulletin Geological Research and Development Centre, Bandung, 7, 1-12.
van den Bergh, G.D., de Vos, J. & Sondaar, P.Y. 2001. The Late Quaternary palaeogeography of mammal evolution in the Indonesian archipelago. Palaeogeography, Palaeoclimatology, Palaeoecology, 171, 385-408. doi:10.1016/S0031-0182(01)00255-3.
van den Bergh, G.D., Li, B., Brumm, A., Grün, R., Yurnaldi, D., Moore, M.W., Kurniawan, I., Setiawan, R., Aziz, F. & Roberts, R.G. 2016. Earliest hominin occupation of Sulawesi, Indonesia. Nature, 529 (7585), 208-211. doi:10.1038/nature16448. van Leeuwen, T., Allen, C.M., Kadarusman, A., Elburg, M., Palin, J.M., Muhardjo & Suwijanto 2007. Petrologic, isotopic, and radiometric age constraints on the origin and tectonic history of the Malino Metamorphic Complex, NW Sulawesi, Indonesia. Journal of Asian Earth Sciences, 29, 751-777. doi:10.1016/j.jseaes.2006.05.002. Watkinson, I.W. & Hall, R. 2017. Fault systems of the eastern Indonesian triple junction: evaluation of Quaternary activity and implications for seismic hazards. In: Cummins, P. & Meilano, I. (Eds. ), Earth Science for Disaster Risk Reduction. Geological Society of London Special Publication, 441, 71-120. doi:10.1144/SP441.8. Zimmermann, S. & Hall, R. 2016. Provenance of Triassic and Jurassic sandstones in the Banda Arc: Petrography, heavy minerals and zircon geochronology. Gondwana Research, 37, 1-19. doi:10.1016/j.gr.2016.06.001.